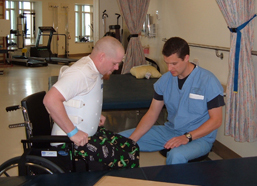 Spasticity is an almost universal complication of spinal cord injury, but the way it manifests itself varies enormously from person to person. In this forum, four individuals with SCI share their unique experiences with spasticity since their injuries, what treatments they have tried over the years, and how they are managing their spasticity now. The discussion is moderated by Dr. Jeanne Hoffman, UW professor and clinical psychologist in the UW Department of Rehabilitation Medicine. Read excerpts below. Presentation time: 42 minutes. After watching, please complete our two-minute survey! Visit our video page to see a list of all of our online videos. 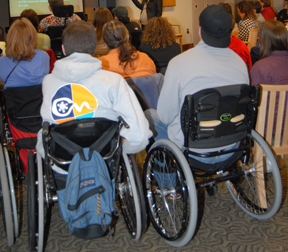 Like most aspects of spinal cord injury, everyone’s spasticity is unique, and it usually takes some trial and error and combination of treatments to arrive at a strategy that works. My spasticity started up around three or four months after injury. I get pretty good spasms in my arms and legs in the morning and afternoon. And when I get into bed at night my legs can “river dance” and start kicking all over the place. I was up to the maximum dose of oral baclofen about eight months after injury, so I started supplementing with tizanidine. I have pretty much stayed with this regimen for the last 10 years, and for the most part my spasticity is under control. I take my meds at 10 am, 4 pm and 11 pm. My spasticity starts building back up as a dose wears off, but as soon as I take my meds I’m pretty much under control. It makes me a little sleepy, but that only lasts five or 10 minutes. I have found that doing regular range of motion also lessens the spasticity. One benefit of my spasticity, however, is that it can help me cough, which has come in handy when I get a cold. My spasticity has been pretty strong since about a year after injury and tends to be very violent. I get spasms throughout my arms, chest and neck that can be triggered by simply rolling over a bump or carpet edge—my arms will fly out and my head will lurch forward. I take oral baclofen three times a day but also use some medical marijuana, which has proven quite helpful. I take it at night so I don’t have to deal with the haze of the high during the day, and it helps me sleep. And the next morning my spasms are minimal. Since the VA will not write a prescription for medical marijuana, my chiropractor recommended a physician to prescribe it. Then it was a matter of finding a dispensary that was knowledgeable and helpful. There are a few items that work consistently for me, but I’m still trying things out. It can be hit-or-miss, since dosing isn’t regulated. The product I use is like a tootsie roll. I can only ingest edibles; I can’t smoke or vape. (Ian uses a ventilator full time.) Range of motion exercise helps reduce my spasticity, too, as does using my RTI bike (stationary exercise bike powered by functional electrical stimulation technology). My spasticity started to develop about two months post injury. It kept increasing no matter how much medication I took. It got to the point where I was taking a full dose of (oral) baclofen, tizanidine and dantrolene, and it still wasn’t working. My spasms were so bad I couldn’t transfer without kicking my chair all over the place, and if I twisted the wrong way I’d go over backwards. I needed help doing just about everything. At first the baclofen pump was unappealing because it’s so invasive—having a big chunk of metal in your gut and a catheter wrapped around inside your body and going into your spinal column. But at a certain point, about a year after injury, I realized it was necessary if I wanted to have any independence. And the pump completely changed everything for me. I started driving and really taking control of my life. I am completely independent. It took a while to get the dose right, slowly building up over about a year until I got to my current dose. I still have some spasms—I’m not a wet noodle —but I’m not bouncing around and flying out of my chair anymore. It’s a matter of finding that sweet spot, which is different for everybody. In my case, I have a continuous infusion at a flat rate with a spike every four hours. That’s what really works for me. Also, I’ve found that staying as active as possible really helps. My spasticity builds up when I sit still. So I hand cycle, play on the Seattle Slam Wheelchair Rugby team, lift some weights, and get out and push around the block. It all helps. 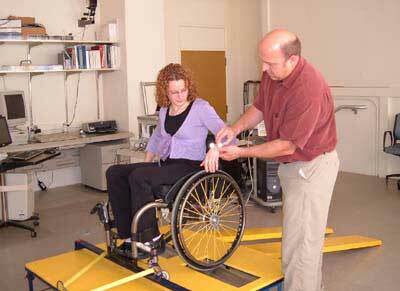 My spasticity became most noticeable five or six months after injury. The amount of oral baclofen I needed to control the spasticity turned me into a zombie so that I couldn’t really function. Tizanidine also completed sedated me. Meanwhile the spasticity was throwing me out of my chair during transfers. I was having trouble holding things, and the extra tone made me rigid and affected my posture and breathing. The worst was getting woken up three or four times a night with violent spasms. After trying all the possible oral medications, I finally had baclofen pump surgery. I had quite a few wound problems related to the surgery site, which have now resolved. My spasticity has calmed down, but it’s not completely controlled. It’s not a simple story but definitely the pump has made a huge impact in terms of my mobility and independence and not being woken up four times a night. Regarding any benefits of my spasticity, the increased tone in my hands is actually quite helpful for picking things up or gripping things.